Maine requires supervisors of food service establishments and non-retail food service establishments be certified in food protection. This means a person-in-charge, an owner, or manager of a food establishment – (i.e., restaurants, bars, cafes, bakeries, delis, mobile vending, food trucks, assisted-living, day care centers, and convenience stores) become certified by taking a approved food manager training course and successfully passing an accredited food manager certification exam. Maine’s Certified Food Protection Manager (CFPM) requirement became effective January 18, 2011. 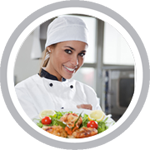 A certified food protection manager must also be hired within 60 days of a new eating establishment opening or when a certified food protection manager leaves employment. We offer online HACCP Training in Maine for: Portland, Lewiston, Bangor, South Portland, Auburn, Biddeford, Sanford, Augusta, Saco, Westbrook, Waterville, Brunswick, Orono, Presque Isle, Brewer, Old Orchard Beach, and many more!